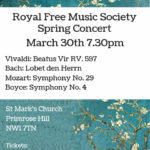 A joint concert with the Hampstead Sinfonietta, with the choir performing Vivaldi’s Beatus Vir, Bach’s Lobet den Herrn and Jesu, Joy of Man’s Desiring and the orchestra performing Mozart’s Symphony no. 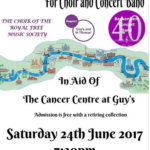 29 and Boyce’s Symphony no. 8. 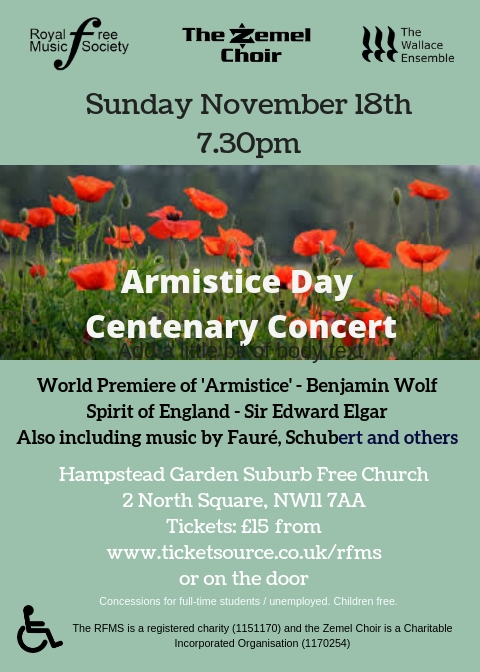 A joint concert with the Zemel choir in aid of the centenary of Armistice day, including a new composition written especially for the occasion by Benjamin Wolf, The Spirit of England (Fauré) and Ravel’s Trois beaux oiseaux du paradis. 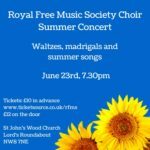 A concert by the Royal Free Music Society choir featuring Brahms’ Liebesliederwaltze accompanied by a selection of madrigals and summer songs. 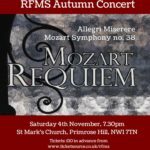 performing highlights from Mamma Mia, Les Miserables and Gold Finger. 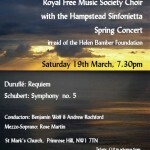 A joint performance with the Sinfonietta Orchestra. A joint performance with the Zemel Choir. 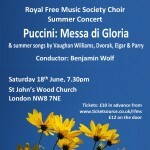 Puccini’s Messa di Gloria and a selection of summer songs by Vaughan Williams, Elgar, Parry and Dvorak. 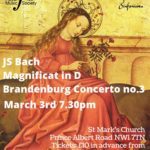 Choir: Duruflé Requiem & Ubi Caritas, Fauré’s Cantique de Jean Racine and some Plainchart. Orchestra: Schubert’s Symphony no. 5. 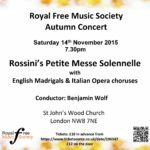 Rossini’s Petite Messe Solennelle, English Madrigals and Italian Opera Choruses. 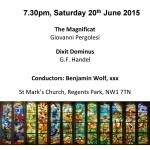 Handel’s Dixit Dominus and Pergolesi’s Magnificat. 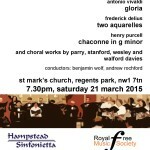 Choir: Handel’s Coronation Anthems, Vivaldi’s Gloria and works by Parry, Stanford, Wesley and Walford Davies. 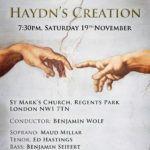 A selection of pieces by Poulenc, Tavener, Bach, Mendelssohn and Handel as well as some Christmas carols. 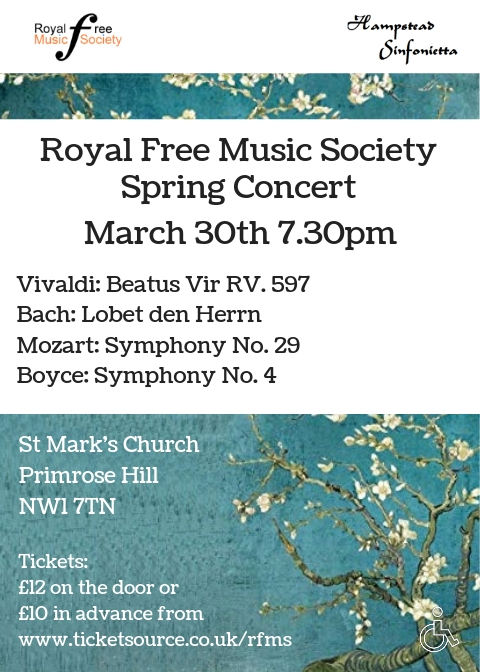 A joint concert with the Zemel choir, singing Mendelssohn’s Elijah. 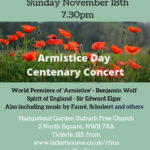 A joint concert with the Beckenham Big Band, singing music in commemoration of World War 1. Britten’s Ceremony of Carols, Hymn to the Virgin and other Christmas carols. Vautor Mother, I Will Have a Husband!